A week ago I had the pleasure of running my second trail race. 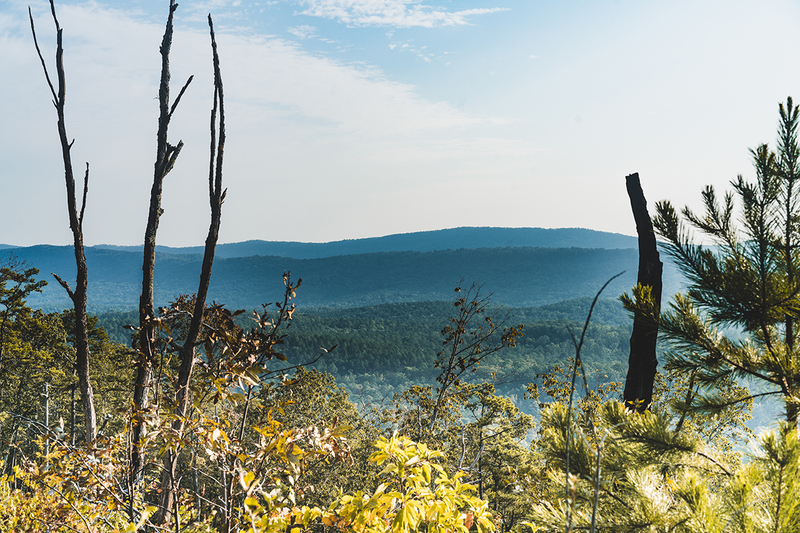 Not only my second for the year – first one was in 1° wind chill early January in Cloudland Canyon State Park, a 12ish-mile jaunt through the woods that magically counts as a half marathon – but my second ever. I’ve only recently fallen in love with trail running within the past 10–12 months, and it’s a love affair I’ve discovered to be rooted so deeply in my soul. 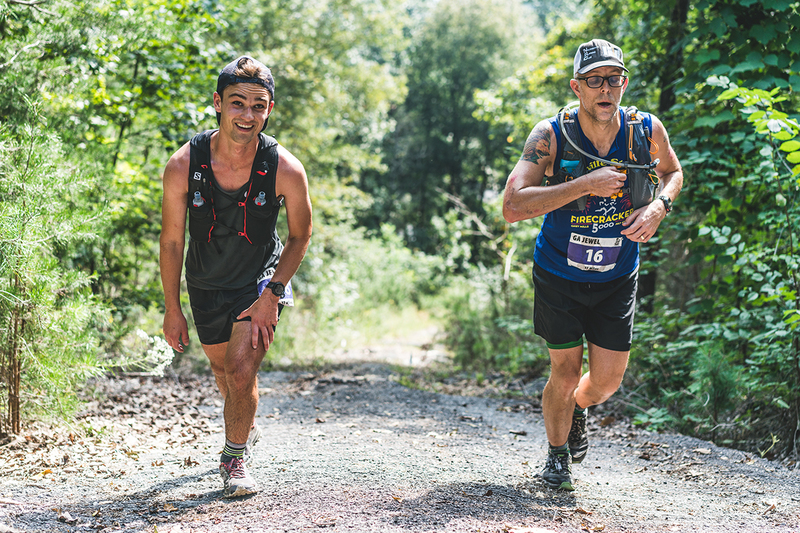 To borrow a slogan from Harley-Davidson, “If I have to explain it you, you wouldn’t understand.” But even so, that rings with a certain level of elitism, and elitism is antithetical to all that is trail running and racing. Still, it’s difficult indeed to explain, but perhaps these ramblings will lift the veil a bit. The Cloudland Canyon Half Marathon was won by a Chattanooga trail veteran named Franklin Baker. Part of the course was an out-and-back section (where you run down the trail to a particular spot then turn around and run back the way you came), and I first saw Franklin on his way back, smile on his face as he greeted us mortals whilst he floated above the ground with a gazelle-like stride. Since this half marathon completely sucked me into the awesomeness that is trail running, I dived headlong into the scene trying to get to know as many people as possible and learn as much about the sport (similar yet completely different than road running). Enter Strava, the online social media platform for endurance athletes. Beyond tracking one’s workouts and races, Strava (Swedish for “to strive”) has a Flybys feature that shows other Strava users who ran the same event. Through this feature, I identified some of the people I met on the trail (looking at you Michael Ryan, Mark Akers, and others) to congratulate them on their race times and Strava-stalk them a bit (you know you do it too…it’s a thing). Franklin was another I got to know through Strava, as far as a mileage tracker slash social media platform can. 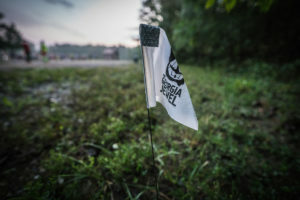 When he commented on attending a homeschool conference with his wife, this spotlighted a second commonality and additional conversation pieces that ultimately led to him mentioning that he and his wife Jenny are directors of The Georgia Jewel, a 100-mile trail race in Dalton, GA that also includes a 50-miler, 35-miler, and 17-miler). I’ve run one ultra distance event (any distance longer than marathon distance), and the training time was a strain on family time with my regular work schedule, family responsibilities, freelance business operation, and sleep mixed in there somewhere, so 2017 was earmarked as my 25K-and-shorter year so training time is manageable. One of my fitness goals for the year is to be able to run pretty much any half marathon (13.1 miles or ~21K at the drop of a hat), so the 25K “limit” would always be within reach. So when Franklin mentioned there was a 17-mile version to their event, complete with personal pitch and invitation, I checked calendar to make sure the date was open and conducive for me to focus on this race. The extra 2K and some change was well within reach. All of this is provided as context to connect the dots from completing my first trail race to registering for my second trail race. Something that I couldn’t have planned at start of the year, but a little improvisation along the trail of life can lead to really great experiences. One of many overlooks from the 18mi course. Most of my running this year has been on the road, but trail running is similar yet completely different than road running. Yes, they’re both running, but trail running is less of a twin and more of a cousin to road running. Everything about it…where the trail takes you (clue – to where your car can’t take you), how the trail requires unique running technique (higher foot raises lest you trip and faceplant, so hip strength is a must, how much steeper the hills are, how the earth absorbs a greater portion of your energy from each step, how your heart rate on trail is higher than on the road – even beyond the exhilaration of being IN nature – how your pace per mile is slower, etc. )…confirms it’s a different game. And the 17-mile distance was just enough outside my current fitness and comfort zone that this became an ideal stretch goal to pursue and carrot to chase. Time to push my “limitations” further out. Prior to one month before race day, the longest I had run all year long (road or trail) was 14 road miles. Add three more miles to this and move it on the trail…that’s a decent comfort zone expansion challenge. Challenge accepted. “-ish” is kind of a thing in trail racing. Though billed as a 17-mile race, the actual course was a bit over 18-ish miles thanks to the addition of another section that took runners off the original course of finishing last two miles on a steep, curvy downhill road to a steeper downhill trail that runs to the base of “Mount Baker” situated ½ mile from the finish, complete with it’s 19-story climb compressed into 1/10 of a mile of forward progress. This is steeper than your basic stairwell, for reference. 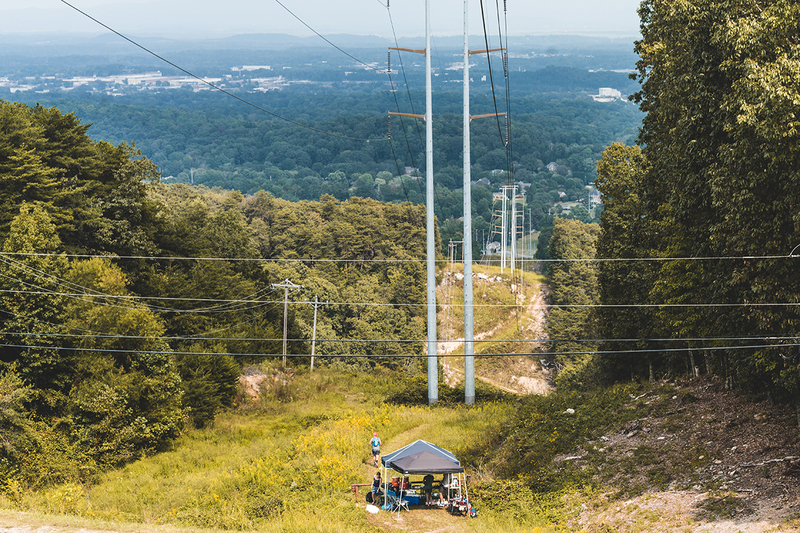 The final aid station atop the epic powerlines descent. One of the key factors that aided my decision to enter this particular race is the planned preview/training run a month before race date so runners could familiarize themselves with the last 17 miles of the 35, 50, and 100 mile distances. Having never run in this part of North Georgia, this opportunity to run essentially the exact same course was a big confidence booster because (1) this training run was my longest trail run at that point and (2) I could pre-visualize the course for four entire weeks to prepare for race day. My competitive side loved this. Yes, trail racing is fun (duh…it’s a trail in the woods), but this also a race. At my age and racing history (or lack thereof), my main competition is myself, and Mr. Myself likes to push himself and suffer a bit in a controlled, competitive scenario. Knowing the course beforehand definitely helped on race day, and it also afforded the opportunity to test pacing strategy and fueling/nutrition strategy for the full, unfamiliar distance on unfamiliar turf. Smart people, those Bakers. The course is another out-and-back course so we were shuttled from finish line to start line, then we ran back to the finish line. When we exited the bus, the bathroom line immediately started to form (an essential thing) and group of friends old and new huddled in small groups to chat away pre-race jitters. 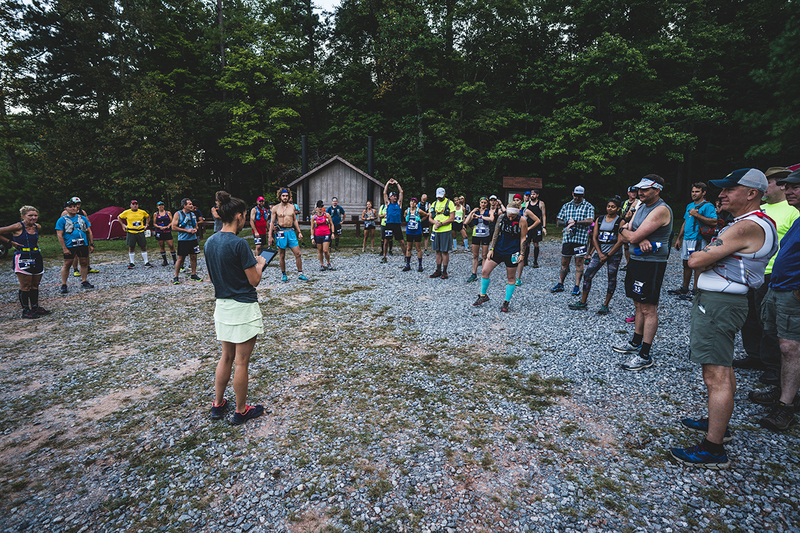 Then the race directors arrive (which was an already eventful day for them…read that link too), Jenny gathers everyone for some final race info and pep talk plus loving prayer to send us off. Race Director Jenny Baker covering last minute details for the 18ish-milers. First mile is essentially one long climb atop the first of three ridges on a trail that is sometimes soft packed dirt and sometimes technical rocks and roots before descending to a creek crossing (the same creek thrice) then back up another ridge via forestry service road to the first aid station, home to amazing volunteers who took my hydration pack off to refill with Tailwind while I used both hands to shovel food into my face, grab some extra Hüma gels, chug some water, and don my hydration pack again with volunteer valet service as if I were just fitted for a custom suit jacket, then I headed to the trail again. All of that in a 79 second pit stop. Yes, I hit my lap timer. Time to continue up ridge #2 on similar but more technical trail. At the 9mi mark, I recalled the previous time I had run this section and the fond memory of tripping on something that I’m pretty sure wasn’t there but that something knocked me down with a barrel roll during the preview run. Yeah, didn’t want to do that again. A mile or so later, my trail buddy Christopher (a triathlete and personal trainer who actually led weekly group boot camps at my office a few years ago when I started exercising again) lilted up the ascending trail as if it were flat and he were floating. And I completely lost sight of him for several more miles. That was a motivational blow since, welp, this is a race, and I’m a competitive one. Just before mile 12, the trail turns upward for a third long climb to ascend to the third high point on the course. This was the spot that I hit a fueling wall during the training run, and I was determined to not have that happen again on race day. But I still hit a wall (though not as hard this time…progress). Apparently, something about my fueling plan and how my body processes fuel at the 12mi mark of a trail run doesn’t play nicely with my competitive drive. Knowing I had another 2mi to go before cresting this hilltop, it was time to dig deep while the air temperature was raising to hot status. And aid station #2 with its unmanned tables deep in the woods with dozens of gallon water jugs (kudos to the volunteers/sherpas who hoofed it all in) provided the goods for a refreshing shower-like water dump over my head and down my back to cool the engine as much as possible. Pretty sure steam rose from my shoulder blades as this water took my breath away. Elevation profile for 18ish mile course. So with hyperactive breathing, it’s time to start this >2mi climb before reaching the new, steep descent portion that has been added. In this section from mile 12 to mile 15, I chased a young “rabbit” with a repeated surge/burnout/rest rhythm and a sloshing belly (hello trail race nutrition woes) only to reach him right before aid station #3 where another group of outstanding volunteers served pickles, potato chips, ginger ale, Coca-Cola, and other fast-burning fuel. My sloshing belly told me I needed salt and electrolytes to aid digestion and fluid transfer so I practically dove face-first into the ginormous salad bowl of potato chips as the pit crew refilled my hydration pack with two liters of Tailwind (upon my oxygen-deprived request…who ACTUALLY needs two liters of fluids for just over three more miles? Apparently this rookie I am thought I did.) Add the easily-24-fluid-ounces of ginger ale and Coke I chugged into my system (NOT a good a idea I would soon learn), and I just voluntarily took on five pounds of jiggle slosh. Pit time 98 seconds then I lurched down the steep descent, gaining two minutes on the rabbit. …we reach the penultimate climb, a short 6–8% grade over 3/4 mile that felt like it went on for days after 17.5 miles. He blew past and down the back side. “You have youth on your side,” I said to him earlier in the race, and that youth turned a corner and was out of sight. Until…Mount Baker. The “gift” Franklin added to the last ½ mile of this fantastic and challenging course. He and I yo-yo’d all day long. Then I saw him 1/3 of the way up that hill (“six floors up”) and put him in my cross hairs. We were shoulder to shoulder as we reached the “14th floor” then I saw him again two minutes later when he crossed the finish line. My #1 opponent in running races is me. Every time. And the game is even more fun when a little friendly competition appears with other runners on the race course too. Definitely fun, and definitely a race. But most importantly, definitely fun. So glad to have completed the single hardest run of my lifetime. This trail is no joke (but well worth the punch line), plus these race directors and volunteers are fantastic. Congratulations all of the finishers and race staff on a fantastic event created for an enriching experience for all who participated. The Georgia Jewel (any distance), complete with Mount Baker, has carved its way on to the “must do this race” list. All this from a chance comment about attending a homeschool conference.